How long have we been told that simulation is best performed early in the design phase when it is easier to explore design alternatives and design changes are less costly? Probably for as long as people have been saying that mesh generation consumes 75 percent of the analyst's time for any simulation. But are engineers actually making design decisions based on simulation results? The 2013 State of Simulation Driven Design Report, written by Chad Jackson, says yes. But there are some surprises in the survey of nearly 1,000 design practitioners (hereinafter engineers). Simulation here means computational simulation including CFD, FEA and other disciplines. Of course, mesh generation plays an important supporting role in design decision, as you'll see. The report's author differentiates between simulations performed during concept, detailed, and final design phases based on when they occur relative to project launch and completion. Concept design simulation refers to simulations performed on designs prior to project launch and/or funding commitments. Detailed design simulation refers to simulations performed between product project launch and completion. It is largely unsurprising that the vast majority of engineers (80 percent) use simulation in both the concept and detailed design phases, as shown in Figure 1. 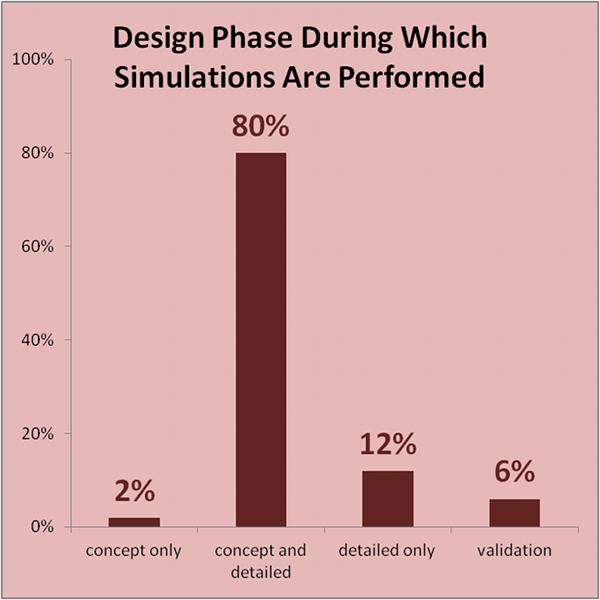 The minor surprise is that 6 percent of engineers use simulation only during the V&V phase to validate the performance of the design they just created. It is surprising because one wonders what happens if the V&V simulation shows unsatisfactory performance. Figure 1: The vast majority of engineers apply simulation during both the concept and detailed design phases. Management is not convinced of the value of simulation during the concept design phase. Simulation takes too long for concept design, when things change quite rapidly. The cost of simulation (hardware, software, manhours) is too high. 58 percent say engineers lack knowledge of the physics behind simulations. 58 percent say simulation takes too long. 57 percent say generating the right mesh takes too long. The first should concern us for many reasons. Note that the expressed concern isn't that engineers don't understand the numerical algorithms in a CFD code. Nor are engineers faulted for lacking an encyclopedic knowledge of every bell and whistle in their FEA solver. The issue, they say, is that engineers lack an understanding of the environment in which their design will operate. But you have to understand the physics because design is not about geometry, it is about performance. Understanding the underlying physics is essential to knowing whether the results computed by your simulation code are realistic and to knowing that you are not computing garbage. Understanding the physics also helps you decide how to interpret simulation results and formulate a design change to improve performance. It is not surprising that 92 percent of engineers engaged in design apply simulation during the detailed design phase. After all, the project is under way and funded and simulation has proven itself to be a cost effective alternative to physical prototype testing. You should not infer, however, that everything is rosy. Engineers still face several challenges applying simulation during detailed design. And they are identical to those faced during concept design, as shown in Figure 2. Figure 2: The challenges engineers face when using simulation in the design process are the same for both conceptual and detailed design phases. 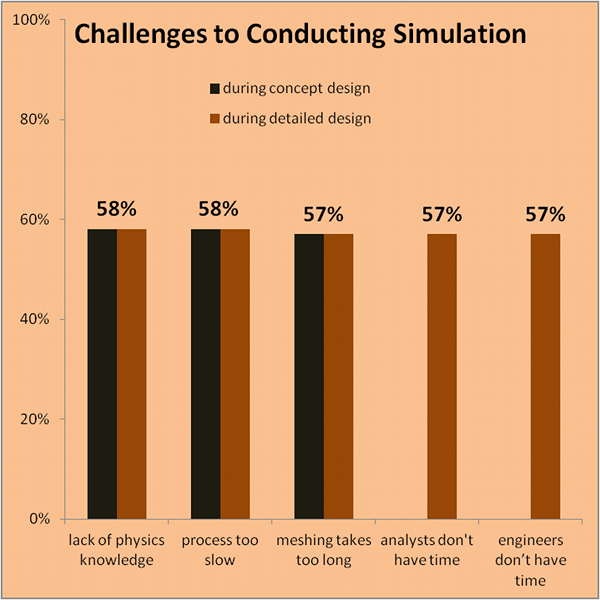 It is surprising that 57 percent of surveyed engineers say neither analysts nor engineers have time for simulation during detailed design. We all know that the design process is not entirely about simulation and the demands on an engineer's time are myriad. But what about these dedicated simulation analysts? What are they doing to support design? It seems they should either be performing simulations or customizing their tools so engineers can do it themselves. I suppose the analysts could be doing V&V simulations, but that is not clear from the data. The report's author uses the term Verification and Validation (V&V) to refer to simulations conducted at the very end of the design process for the purpose of confirming that the design performs as desired. However, that is not the definition of V&V used in the CFD world. In fact, it is almost the polar opposite. V&V refers to simulations performed outside the design process for the purpose of ensuring that the software tools compute sufficiently accurate results (and/or results with known and useful inaccuracy) for objects and environments of interest to the organization. This usually includes comparison of simulation results to benchmark data. As an example, refer to the AIAA Guide for the Verification and Validation of Computational Fluid Dynamics Simulations. As noted above, 57 percent of engineers say that meshing takes too long and therefore poses a challenge to performing simulation effectively during the design process. Too long relative to what? How long exactly is it taking? The time spent on preprocessing is illustrated in Figure 3. 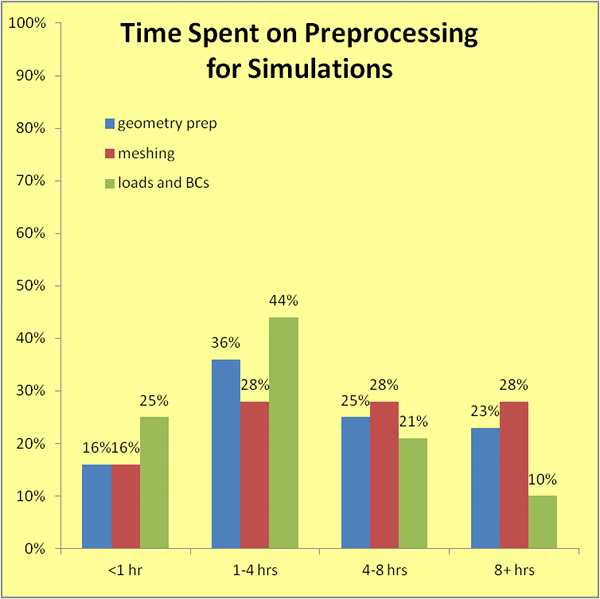 Figure 3: Between one to four hours per week seems to be the sweet spot for each of the three main preprocessing tasks: geometry preparation, meshing, and applying loads and boundary conditions. The infographic presentation of this data in the report makes the complaints about meshing a bit more dubious. In fact, it appears that engineers spend as much time meshing as running the solver and less time meshing than analyzing simulation results. However, if you combine CAD geometry preparation with meshing and keep in mind that the engineer's end goal is the simulation results – and lots of them – you can appreciate that any time spent preprocessing is perceived to be too long. Further note that the complaint about meshing as stated in the report is “generating the right mesh is too time intensive.” So in addition to the general complaint about the time involved, the additional complaint is the level of expertise required to ensure that the mesh is efficient (not too many mesh cells) and accurate (not too few mesh cells). This detail goes back to the V&V that should be conducted by the dedicated analysts and from which best practices are established, including what makes for the right mesh. Pointwise sponsored Lifecycle Insights' collection of the survey data and preparation of the final report.